After being granted planning consent, subject to the condition that a 6 metre wide easement next to the creek is included for a possible future walking track and cycleway, the developer has applied to council to remove requirement. An easement is simply a line on the plan to allow such a route to be developed if needed at some point in the future. The cycle-way from UNE to east Armidale currently ends at MacDonald Drive (see Google map, right). This development is only a short distance further on. Governments are spending lots of money on bike trails, so why not safeguard a possible future extension to the well-used Armidale bike trail? The estimated health benefits amount to $0.75 per km cycled, according to an Australian government report. A research article in 2017 showed that regular cyclists have a 46% lower risk of developing heart disease, a 45% lower risk of developing cancer and a 41% lower risk of dying in any given year - see below. Lines on a plan cost nothing - there's no need for fencing or maintenance - so let's at least take this zero-cost option to safeguard a possible extension to the popular Creeklands cycling trail through this development. In December 2016, council decided to retain the easement and issued a revised consent in Feb 2017 including a requirement to create the easement. In response to a further application to delete the easement, council staff have recommended in favour of the developer. This recommendation appears to be based on needs identified in the 2012 bicycle plan, not the needs of a city that might grow to 35,000, nor transport needs in 50 years time, and does not consider the recreational and tourism benefits of a longer bike trail around the city. So let's retain this zero-cost line on the plan to safeguard future transport and recreational options. In 2013, an Australian Government Discussion paper: ‘Walking, Riding and Access to Public Transport’ reviewed the benefits of cycling and concluded: “the net health benefit (adjusted for injury) for each kilometre cycled is 75 cents – about half of the total economic benefits of a typical bikeway project”. A British study published in 2017 took a comprehensive look at the health benefits of bicycle commuting, and the results are staggering. Over the course of the study, the 263,450 subjects had a 41% lower chance of death than those who didn’t, including a 52% lower risk of dying from heart disease and a 40% lower risk of dying from cancer. They also had 46% lower risk of developing heart disease and a 45% lower risk of developing cancer. Cyclist Tom Babin wrote: "If a pharmaceutical company created a pill that could reduce your chance of dying by almost half, with particular success against those stubborn scourges of humanity of cancer and heart disease, it would be heralded as a wonder drug." 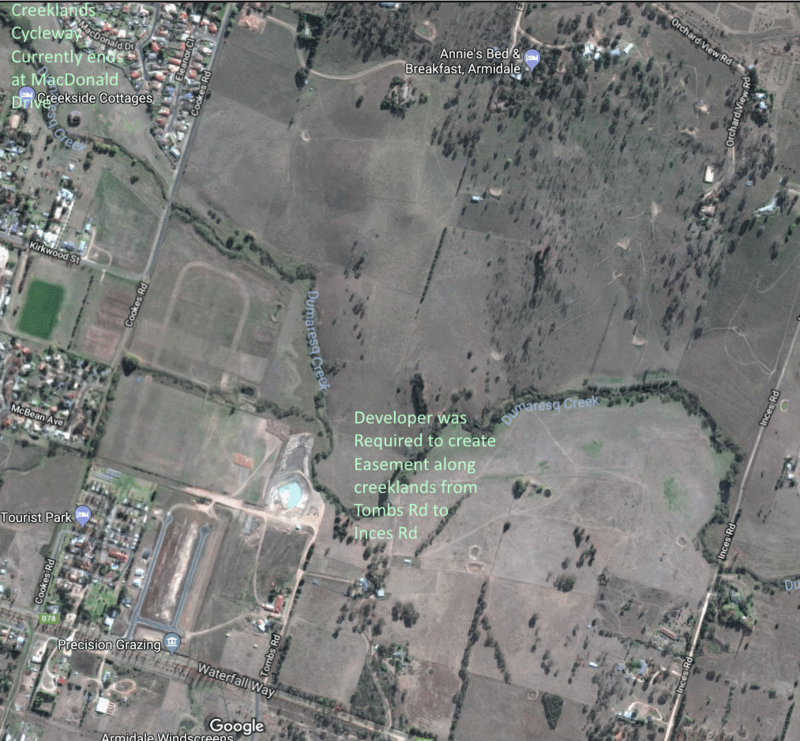 The report to Armidale Regional Council meeting of 28 March 2018 argues that there is no current strong justification for extending of the Creeklands cycleway, based on a council document written in 2012. That plan was meant to last a few years, not the many decades that this subdivision layout will remain. Given the benefits of cycling and recreational trails, a shared bike and walking trail along this part of the creeklands could be a valuable future asset. Not preserving this line on a plan will forever deprive the community of this potential. The graph below shows the stunning rise of obesity in America, but Australia is not far behind.